You're not anonymous. I know your name, email, and company. This is a repost of my original post on 42floors.com. Sumit Suman recently visited a site, did not sign up for anything, did not connect via social media, but got a personal email from the site the next day. I’ve learned that there is a “website intelligence” network that tracks form submissions across their customer network. So, if a visitors fills out a form on Site A with their name and email, Site B knows their name and email too as soon as they land oan the site. discretely integrate with your existing web site to identify visitors to your website. 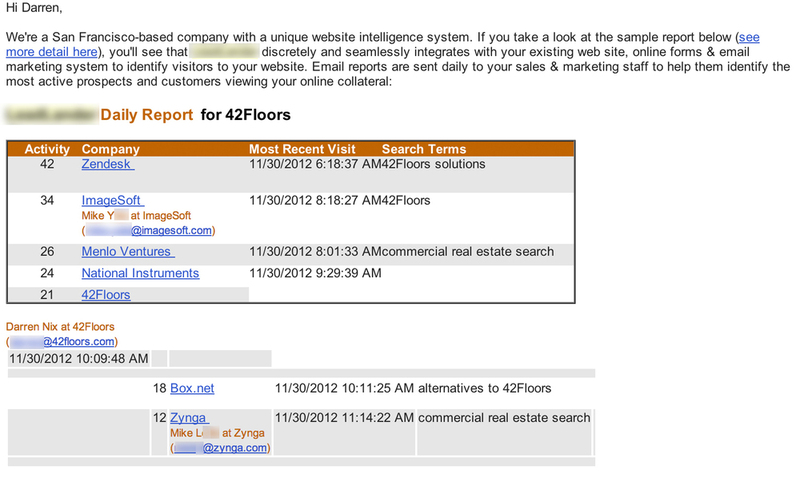 I get B2B marketing emails all the time but what caught my eye was the inclusion of a report snapshot for 42Floors.com showing names, companies, and emails of site visitors and the information seemed plausible. For example, if [a visitor] went to XYZ.com and filled out a web form and then [the visitor] later visited 42floors.com, [42Floors] would be able to identify [the visitor] by name/email as well as company details even though [the visitor] never filled out a web form on [42Floors.com]. I was still skeptical. So I signed up for a demo account and installed (and hastily removed) the tracker . As promised, I began to see personally identifying information about our anonymous visitors. Here are the live reports from this week (sidebar). Although only a small subset of users were identified with an email, that is likely due to the fact that this particular network is one of the smaller ones and hence only has information on a small percentage of all internet users. I will be following up with an analysis of the reach of their larger peers. When a user visits a site without ever having voluntarily supplied information to that site, should the user have an expectation that their identity is private until they chose to reveal it? Farfetched? I don’t think so. I expect to see the first iterations of this Home Depot scenario become reality within a few years time. All the necessary pieces already exist, they just haven’t been combined yet. The realization that I’m being personally identified by name as I surf the net is deeply discomforting. At 42Floors, we’ve made the decision not to use any visitor identification tools. As for my own Macbook, I’ll probably write a browser plugin ala AdBlock to kill the trackers that make this identification possible.